How Much does a Solar Powered Generator cost? In the recent past, most people in the world have embraced the use of solar generators. It is quite fascinating how best solar generators can replace most of the common fuel generators. The demand for solar generators has highly increased. It has led to many manufacturing companies increase their production of such generators and their components. However, customers need to be aware of what kind of product they offer since there are so many products one can purchase and they do not suit their needs. The Aeiusny 288Wh is a portable powerstation designed with ease of transportation and use in mind. This solar generator is designed to power mobille devices like phones and tablets, and other gadgets like cameras, drones, speakers, and the likes. The Aeiusny 288Wh can lso power low energy cost home appliances and can be charged by solar panel, car, or wall socket. The Aeiusny 288Wh is only 7.05 lbs (3.2 kg) with an 12.70 * 5.91 * 8.66 in dimention, making it highly portable. It is equipped with a 288Wh / 500W lithium battery and one full charge is capable of providing a 50W device with power for over 7 straight hours. To dispense this energy, solar generator is equipped with 11 outlets which include 3 AC ports, 4 DC ports, 4 USB ports; all of which are located either at the front, or the back of the solar generator. With this, solar generator can power anything from phones to drones, to even household appliances with an energy requirement not more than 500W. The Aeiusny 288Wh can be charged by using either socket power, car power or solar power. It is recommended that the solar panel to be used to charge it is between 40W – 100W. 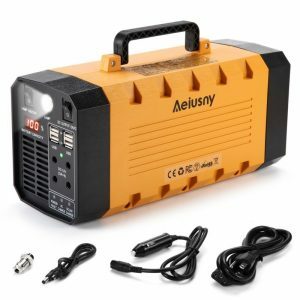 The Aeiusny 288Wh Solar Generator comes equipped with a LED display to determine how much power is stored on, stitches to turn solar generator and its functions on and off, an inbuilt flashlight, a user manual, a solar input charger, a car charger, an AC power cord, and a 12 month warranty. It is small but can power up to 7 devices at the same time. 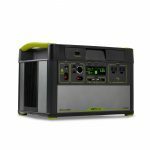 This solar generator is a wise choice for anyone looking for a power station that offers more mobility and can be carried everywhere and anywhere, at anytime. It is also a smart choice for people who use multiple gadgets at the same time, as a solar generator can very easily charge 2 monile devices and 1 laptop, and still have enough space to take more gadgets. The Ecoflow River Portable Power Station is a portable solar generator designed to keep mobile devices and small gadgets charged on when other sources of power are not available. With a portable build, this solar generator was created for both indoor and outdoor, use and can be easily transported from on point to another. Capable of being charged through wall socket, car or solar panel, the Ecoflow River is a good choice for an emergency generator to keep handy. Weighing only 11 lbs (5 kg), and being 9.8 inches long, 6.3 inches wide, and 8.2 inches high, this solar generator has a highly slick, portable and compact build, making it perfect for travel and mobile use. The Ecoflow River is also equipped with a lightweight lithium ion battery with an outstanding 114000 mAh capacity, making it an absolute powerhouse. Generator also comes equipped with 2 USB Quickcharge 2.0 ports, 2 USB-A ports, 2 USB-C ports, 2 AC outlets, 2 DC outlets, and 1 12V car port, giving enough outlets to dispense the outstanding amount of energy stored into it. Solar generator also comes equipped with an LED display to help monitor how much power the generator still has on, indicators to show when is being charged or charging other devices, and switches to turn on or off certain functions. The Ecoflow River is equipped to dispense up to 500W of energy and hence, is capable of powering devices from laptops to drones to even home appliances with an energy requirement of less than 500W. If you are looking for an absolute powerhouse which also happens to be both portable and durable, then this device is just perfect for you. It is also perfect for family use as its incredible 114000 mAh battery capacity makes it enough to keep the mobile devices of the entire family powered. The device is also a good choice for emergency power supply and use for outdoor events as its large battery capacity is sure to keep things powered for a much longer period of time. When it comes to portable power stations, the Goal Zero Yeti 1400 is probably high up on the list of the best ones you can find. With so many unique features like being mobile app equipped, making it posible to control and monitor power usage directly from your mobile phone, the Goal Zero Yeti 1400 is definitely one of a kind. Weighing 43.7 lbs (19.8 kg) and being just 13 inches wide, 18 inches long and 13 inches high, has two sturdy handles at opposite sides on its topmost part. All neccessary ports are located either in front or at the top of it (which has a lid to protect the solar generator from moisture and external heat. It is equipped with an incredible 396000 mAh battery capacity and can produce an outstanding 1500W continuous output. With such an incredible amount of energy to dispense, the Yeti 1400 is equipped with several AC, DC, USB, and CIG outlets and can keep up to 10 devices powered at once. This Solar generator capable of powering not only low energy cost devices but also much heavier appliances like blenders, power tools, and even hospital machines. It comes with an LED display and also Wi-Fi capabilities to help connect to the mobile app which lets you control it from your phone. This device is the perfect choice for anyone looking to purchase something with some pretty heavy output. Capable of producing up to 3000W surge, this device would feel that position perfectly. It is also a perfect emergency generator as it has a 10-12 month shelf life, making sure the solar generator can retain whatever charge your place in it for a very long time. Weighing about 20 kg, however, it could be a bit cumbersome to simply carry about for a long time. Nevertheless, generators weight doesn’t stop it from easily being carried from one place to another where it can be used. 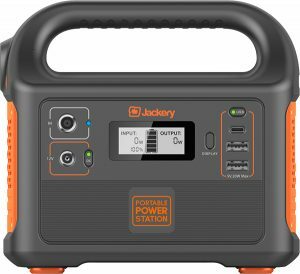 One of the smallest power generator available, the Explorer 160 model of the Jackery Portable Power Station is a perfect alternative source of power, both for indoor and outdoor use. Built with portability and ease of transport in mind, the Explorer 160 weighs a simple 3.84 lbs (1.74 kg) and has a simple, compact build, making it both lightweight and easy to carry. The Explorer 160 has a 167Wh rechargeable lithium battery (46,400 mAh), which can be recharged by either plugging solar generator to a wall socket, a car, or a solar panel. Charging it with a car or socket would take about 5 hours for a full charge, while a solar panel would take about 8 to 10 hours depending on the weather. The Explore 160 comes equipped with one USB-C port (5V 3A), two USB-A ports (5V 2.4A), one DC 6mm port (12V / 7A) and one AC inverter (110V 50Hz 100W – 150W) and is suitable for charging gadgets like phones, laptops, and even drones. It is also near-soundless and gives off no fumes, making it perfect for use during camping, hunting or picnics. With its compact build and sure handle, the Explorer 160 offers you all you need with less luggage. This solar generator has a LCD display that shows how much power is stored on it at a given time. The Explorer 160 also has a powerful LED flashlight built into it and comes with a 24-month warranty. Portable, environmentally friendly, safe and efficient, the Explorer 160 is the perfect mix of functionality and convenience. This device is perfect for use as an alternate source of power for gadgets and small devices. It is especially preferable for use outdoors since its slight build and lightweight makes it easy to carry about. The inbuilt flashlight also makes it perfect for portable camping generator needs, hunting, and other activities where staying out at night is very likely. All in all, this is definitely a good choice for anyone looking to get something portable but also having high capacity. 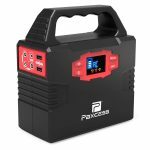 The Paxcess 100W Portable Power Station is a portable emergency power generator designed for easy transportation. With a 40800 mAh battery capacity, the Paxcess 100W is capable of powering mobile gadgets, cameras, drones, and even camping and some home appliances. Designed for both indoor and outdoor use, the Paxcess 100W Portable Powers Station is a perfect fit for an in-house power bank, or a camping trip power generator. 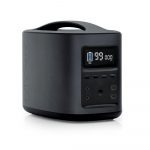 The Paxcess 100W is a lightweight power station weighing only 3.3 lbs (1.5 kg). With a solid and compact build, this solar generator is only 6.89 inches high, 3.15 inches wide, and 6.5 inches long, making it even easier to carry about, either by hand or packaged in a backpack or traveling bag. With a 40800mAh battery capacity and a 110V and 100W output capacity, the Paxcess 100V is capable of keeping your mobile devices and other low energy cost gadgets and appliances powered. To dispense energy already stored in the Paxcess 100V, it comes equipped with 2 110V AC outlets, 3 12V DC outlets, and 2 5V USB ports. When low on power, this solar generator can be charged using either a wall socket, a car, or a solar panel. The device also comes with an LED display to indecate how much power is indicate still contained in the device, buttons to turn solar generator on and off, and an inbuilt flashlight for emergency purposes. The Paxcess 100W was built for travel convenience. This device is perfect for anyone looking for a powerful power bank, mainly for mobile devices and other low energy cost appliances. 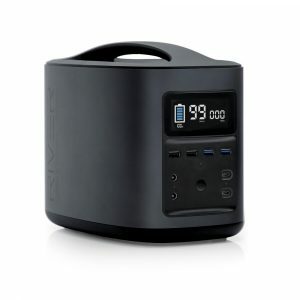 For those looking for a portable power station for much heavier appliances and gadgets, this is probably not the best choice. It is perfect however for people who already have a larger power station, but are looking for something more portable and convenient. Designed to look exactly like a briefcase, the Renogy Phoenix 20W is a portable generator designed with not only travel ease, but also class, in mind. 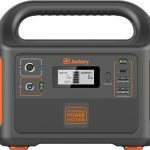 Unlike most other power generators, the Renogy Phoenoix is the complete defination of an all-in-one kit, not only containing a power generator, but also containing a 20W built-in solar panel for charging the solar generator battery. The Renogy Phoenix 20W is quite easily unique. 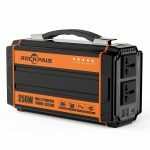 Built like a briefcase, it can be opened to reveal its in-built 20W solar panel in other to charge the solar generator battery. This can also be extended to 120W by combining the device with other external solar panels in order to increase the charging capabilities. This solar generator comes equipped with a CIG port, 2 DC ports, 4 USB ports and 1 AC port, all of which are located in enclosures in other to provide the device with some added water resistance. This solar generator has a battery capacity of 16Ah (16000 mAh) battery and can produce up to 150V output of pure sine wave, capable of charging mobile devices and small gadgets and appliances. When low on power, the Renogy Phoenix 20W can be charged by wall socket, car or solar panel. The device weighs 12.8 lbs (5.8 kg) and is only 13.8 inches tall, 16.1 inches long, and 3.9 inches wide. It also comes with a 25 year power output warranty! The Renogy Phonix is an all-in-one, self-sufficient, portable power station that contains everything you need. The Renogy Phoenix is a perfect choice for any one looking for a travel power station, be it an off-the-grid trip or simply a long journey. Renogy Phoenix is well suited for keeping mobile devices powered, and could even charge your laptop 4 times over. This Solar Generator is also fit for use with household appliances with a power requirement less than 150W. Having only one AC port however, Renogy Phoenix is not built for use with more than one of such appliances at once. Nevertheless, the generator is perfect for use with more than one mobile device at once, and could even charge an iPhone 6S more than 30 times before finally running low on juice! The Rockpals 250-Watt Portable Generator is an all-in-one portable alternative power source that is easy to move and lasts longer than your average power generator of this relative size. Designed to not only keep gadgets powered but also to provide an alternate source of power for household appliances, the Rockpals 250-Watts is a brilliant addition to every home and outdoor event. Weighing about 5.5 lbs (2.5 kg), the Rockpals 250-Watt is slightly heavier than the average power generator of similar size ─ L 10 inches, W 4 inches, H 6 inches. This is however due to having a larger battery capacity than its contemporaries. Rockpals 250-Watt also has larger output capabilities. With an output capacity of 250 Running Watts and a 300 surge Watts, the Rockpals 250-Watts can power larger appliances than the regular power station of relatively the same size can. Rockpals 250-Watt also charges gadgets relatively faster. The RP250W can be charged by a wall socket, car or solar panel and comes equipped with 2 AC 110V 250W outlets, 2 USB ports, and 4 DC 12V 60W ports for dispensing stored power. The RP250W is also a pure sine wave inverter, which means it runs faster, quieter, and cooler than regular power stations, providing clean and stable electricity, just like what would be found on a wall socket. The RP250W also comes with an 18-month guarantee, an AC adapter, a car charger cable, a DC to Cig socket adapter and a user manual. This device provides larger output capacity and with larger battery capacity, charges for longer. 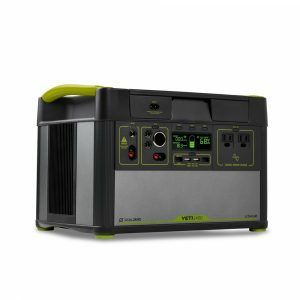 The RP250W is the perfect generator for anyone looking to get as much power as possible in a relatively small package. It is also perfect for use with household appliances as its higher output capacity makes it able to power even heavier appliances. This device is also perfect for outdoor use and can be easily transported with its comfortable handle. Rockpals 250-Watt , however, doesn’t have a built-in flashlight, so if you ever plan to take it outdoors at night, always remember to go along with a reliable source of light. 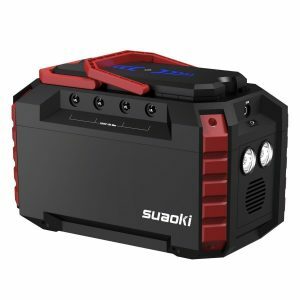 The Suaoki G500 Portable Power Station is a 22.05 lbs (10 kg), easy-to-carry power generator with an incredible 500Wh battery capacity designed to run household appliances and keep mobile devices and other gadgets powered for longer. Designed for both indoor and outdoor use, SUAOKI G500 is easily mobile and can be used anywhere at any time. SUAOKI G500 can also be recharged anywhere, either through wall socket, car, or solar panel. With a compact build, the G500 weighing just over 10 kg is only 21 cm high (with handle raised), 28 cm long, and 19 cm wide, making it pretty handy. The handle of this solar generator can be dropped to further reduce the size, making it easy to pack for transportation. With a 500Wh battery capacity, SUAOKI G500 comes equipped with two 300W AC outlets, two QC3.0 USB-A ports and one QC3.0 USB-C ports, two 12V DC ports, and one 12V/10A car port as its output options. For input, the device comes with a solar charging port, an Adapter charging port, and can also be charged using the 12V/10A car port. Morealso, the G500 is equipped with a LED display to monitor the amount of power still on the solar genrator, an MC4 solar charging cable, an adapter, a car charger cable, a user manual, and a 24-month warranty. SUAOKI G500 also comes with power button to turn the AC and DC outlets on and off, further optimizing the battery life of the device. This device is quite simply a portable powerhouse. This device is perfect for anyone looking for more than a power bank for their mobile devices. With a 500Wh battery capacity and up to 300W output, this device can power the necessary home appliances including your TV, fridge and even pressing irons (300W or lower). It is also a perfect outdoor tool and can be used to power outdoor events like picnics, or other gatherings which require average energy consumption as this device can dispense a reasonable amount of energy for a long period of time. The Suaoki S270 Portable Power Station, as the name implies, is a convenient and easy-to-transport power source, designed to keep small gadgets like phones, laptops, drones, cameras, and other small home appliances powered. Fit for outdoor use, SUAOKI S270 has both a portable and durable build and can be charged with a solar panel, making it perfect for both travel and outdoor events. Seeing as SUAOKI S270 is noiseless and fumeless, it is also perfect for indoor use. 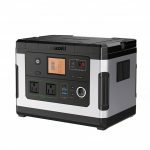 Packaged to maximize convenience and minimize space consumption, the Suaoki S270 is a compact power station created for transport ease. The S270 has two sturdy plastic handles which can be pulled down when not in use, making sure SUAOKI S270 consumes even less space. This solar generator can be charged using either a wall socket, a car or a solar panel, and is equipped with 2 AC outlets (with a max of 100W and a 150W peak power), 4 DC ports (15A / 180W max), 1 QC3.0 USB port (with an 18W max), and 3 USB ports (with a 10.50W max). To back up such heavy charging, the S270 has a 150Wh battery capacity to keep it powered for longer. SUAOKI S270 also comes with an inbuilt flashlight, an inbuilt MPPT controller which helps this solar generator to adapt to optimal voltage while being charged with sunlight, a battery management system which controls the voltage and temperature of the device, and an 18-month warranty. This device is the perfect example of the term “more output, less luggage”. This device is a perfect fit for those looking to get a power station with a considerably large output potential. With the number of output terminals on the S270, it is perfect for use by multiple users all at once. It is also a perfect choice for an indoor source of power, as it is not only perfect for powering gadgets but can also be used to power smaller home appliances (it can even power a mini-fridge). It is important to note however that SUAOKI S270 can only power devices with an energy requirement of less than 100W. 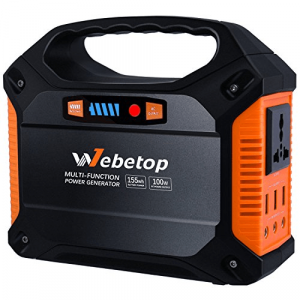 The Webetop 155Wh 42000 mAh Portable Generator is a portable inverter designed to keep mobile gadgets charged and to power household appliances that have little energy cost. Weighing only 3.5 lbs (1.6 kg), solar generator is easily portable and can be used both indoor and outdoor. From mobile phones to laptops to digital cameras or even drones, the Webetop 155Wh 42000 mAh is fit to keep your devices up and running for a good while until your power issues get resolved. The Webetop 155Wh 42000 mAh, as the name implies, is equipped with a 42000 mAh battery capacity and weighs only 3.5 lbs. Packaged with convenience in mind, the Webetop 155Wh 42000 mAh is only 6.73 inches (17.09 cm) tall (handle included), 7.67 inches (19.48 cm) long, and 3.54 inches (8.99 cm) wide, making Webetop 155Wh a easy to carry around, either by hand or placed in a backpack. Webetop 155Wh comes equipped with 2 AC outlets (110V, 150W peak power), 3 DC ports (12V, 180W max), and 3 5V USB ports. With this, this device can power anything from mobile devices to car refrigerator, to even a TV. When low on juice, the device can be charged by either car, wall socket or solar panel (12V-24V, 18W or above). Webetop 155Wh also comes equipped with an inbuilt flashlight, a car charger, a wall adapter, a cigarette light adapter, and a user manual. It is small but still durable and very powerful. This device is perfect for anyone looking to have a backup for his or her mobile device. With a 42000 mAh battery capacity, your smartphones or tablets wouldn’t be going off anytime soon. It is also good tool to use to power your laptop, camera or even drones. It is also perfect for camping and other outdoor activities, as it is quite easily mobile and can power most camping appliances, including a TV. The inbuilt flashlight also makes it a good emergency tool and makes it a wise choice for outdoor activities that might spill into the night. The focus on having a good guide while choosing the best solar generator is that it fully serves your needs. Before deciding to buy a solar generator, it is of much essence to understand the concept these particular generators use to function. Solar generators are generators which basically and only obtain their raw energy from the sun and convert it to usable energy sources for alternating current (AC) power. As stated from the above paragraph, they function differently from the fuel and dual fuel generators which uses fuel as raw energy. As the solar generator gives the final useable energy, there has to be that specific path or process the raw energy goes through starting from the solar panels. A solar generator has two main components i.e., solar panel and a portable power generator. The solar panel is capable of converting sunlight into electricity whereby the sun’s molecules triggers molecules hence creating a flow of electricity. In a brief explanation, solar panels are liable for capturing photon and charging the battery. The portable which is responsible for completing the entire action has two minor components which are an inverter and a battery. The inverter is set to convert the direct current (DC) power into AC Power. It is important to consider the devices, tools or appliances you intend to power using a solar generator even before buying one. It is influenced by the availability of different kinds of solar generators. These solar powered generators are in five major categories, and they run different tools, appliances, and devices respectively. First, a portable solar generator has a power backup for smaller appliances and communication devices such as laptops, small fans, mini-fridges, drone, etc. Also, it capable of accommodating power DC such as coolers, small vacuum cleaner, and LED Lights. Second is the home solar generator which carries a huge home power backup. It can accommodate devices such as refrigerators, computers, T.Vs, power tools, medical equipment and also laptops. In brief, the home solar generator has power back up to devices and tools requiring too much power to run. The third category constitutes Portable power supplies which are efficient for camping hence making it great for RV’s and outdoor cabins. The fourth category is the solar laptop chargers which are mainly for portable solar chargers and laptop solar charger. It is efficient to power USB devices such as tablets, phones, and Kindles. A laptop solar charger ensures your laptop is charging and you are on. Finally, it is the solar phone chargers and solar backpack chargers. This one can run the following devices: phones, Tablets, Kindles, Bluetooth speakers, MP3 players, GPS systems and any other 5V electronic device. Different models and varieties of solar powered generators come with different prices. The cost is determined by the purpose the solar generator is to serve depending on the above five categories stated in the above paragraph. Customers once again need to be aware of the specific functions they intended a solar generator to complete and at what price they may get it. Besides quality also influences the cost of solar-powered generators. Solar generators can easily be purchased from Amazon since it is accessible to the large world and has fair prices for its quality products. It is vital to have a clue about prices of particular solar generators and related products range at while planning to make a purchase. Solar power generators have aided many people around the world more remote areas with no electric power connection and those who give priority to solar energy as their source of usable energy. Besides, most organizations have been campaigning for an eco-friendly environment and using solar energy is one of the best practice which is highly encouraged. It serves as an advantage since it helps reduce the amount of CO2 we emit to the environment while we use certain machines which use fuel energy. Who would not want to save some money? Solar energy is one way which can help yourself over 400$ annually if you install solar generator system as a source of your energy. We all opt and feel in some peace when we live in an environment with very little or no noise. Solar powered generators do not produce loud noise while in operation compared to the fuel generators which produce noise which is unbearable to human ears. You can imagine the amount of noise a gas powered generator will make while you want to sleep, and also you want to leave your gadgets and devices charging! With a solar-powered generator, you are guaranteed of very minimum noise hence your concentration while doing other things is not interrupted. The aspect of solar powered generators having really silent generator also makes it suitable to be used indoors. However, there are other features which makes a solar powered generator convenient for indoor use. Different from gas-powered generators it has no moving parts hence hold the aspect of safety in the house and possibility to use it as a standby generator, also it does not emit harmful fumes since it depends on solar energy and not fuel and it easy for mobility from one place to another. Solar powered generators enhance your safety at night compared to gas-powered generators whereby in case you are experiencing a power blackout, and you need back up, you are required to take it outside and leave it running. Solar powered generators are quite effective in such a way they take care of your security and safety. Finally, solar generators are convenient and easy to use. The key to having achieved maximum results from a solar powered system is ensuring that it is installed for it to run all day as required. Also, as long as your solar panels are getting enough sunlight, you can use the saved power at night and during the day to run your devices. In brief, solar powered generators do not require you to dedicate too much time maintaining them compared to gas-powered generators whereby you are saddled with the task of often changing oil, managing the gas and the noise produced. Besides, fuels can be expensive dangerous and difficult to store. Sunlight is for free to everyone. With the above advantages, you discover how effective solar powered generators can be regarding home power use for emergencies, running machines, charging devices while travelling and also it is quite beneficial to those who like camping. The fact that solar powered generators are very vital and efficient for many, it also has some disadvantages too. First, you realize that installing a solar-powered generator and its system is quite expensive compared to fuel-powered generators and repairs might be difficult. Also, from that comparison, you also realize that both may have the same power output, but the fuel generator will have a more electricity production capacity. Secondly, solar-powered systems are slow regarding charging the batteries they have hence the very small amount of energy is stored in the battery. The main aspect contributing to this disadvantage is due to the usage of lead-acid batteries and which are heavy hence affecting the mobility of the generators. Also, most solar generators have a limit amount of battery backup with a maximum capacity of 1500 watts. Finally, it is sometimes not possible to use electrical appliances with a large start-up power load using solar generators. It is because energy is released only in the form of AC output at defined rates. The rate of battery charging and discharging are controlled by the battery charger and inverter and are only efficient for appliances such as lights. Also, with the knowledge that solar powered generators are dependent on sunlight which is natural and as human beings, you cannot control the climate, you might have very little power when it is winter period due to inadequate sunlight. Considering whether to purchase a solar generator is determined by your situations, survival plans and also what you prioritize between a fuel generator and a solar generator. A solar generator is quite effective if you opt to install it as an emergency power back up for your home. It will provide with home power back up to run tools, machines and other electrical appliances such as T.Vs, laptops, computers, refrigerators, etc. The solar generator is suitable for those camping and travelling and intend to charge a few smartphones throughout the day. Also, you can run a small refrigerator in times of an emergency to ensure your stored food, fruits and drinks remain fresh and edible. Solar generators will suit people who need efficient lighting at night. For example, street lights, house bulbs and security lights outside your house and compound. Also, solar lighting will be of much essence and help a group of people camping and undertaking some night activities. Solar energy from a refrigerator will help you run your microwave all day as you warm your foods or drinks and do some baking. Finally, if you need to run a CPAP machine, then a solar generator will do this for you effectively. However, it is advisable to have several solar generators to ensure you have enough power back up since a single solar generator is not efficient. It is quite important to consider and have a plan for your power back as you undertake your daily activities at home, working stations and as you travel to ensure your appliances and devices powered. While planning to buy a solar generator, you opt to do intensive research about the particular generator you want and satisfies your needs. Also, having a budget is important as it helps you make up your mind on which solar generator you can purchase at that particular price fitting your budget. However, it is good to look into features of that particular solar generator carefully you intend to buy so that you will get the right product that suits you. 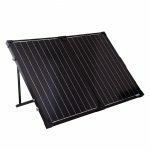 They are mainly three varieties of solar panels which are mono-crystalline, poly-crystalline and thin-film solar panels. Mono-crystalline solar panels are expensive but it because they are the best quality and achieve a high-efficiency rate of about 15%-20%. Also, they are effective in areas with high temperatures. Polycrystalline panel which operates slightly less efficiently in high temperatures hence this makes them achieve an efficiency rate of 13%-16%. They are made of multiple crystals hence making them different from mono-crystalline which is made from one crystal. Poly-crystalline is less expensive hence many people tend to go for it despite its reduced quality. Thin film solar panels achieve an efficiency rate of 7%-13% since they are less efficient, are the lowest quality and are less convenient compared to other crystalline sorlar panels. This makes thin-film panels cheap. It is important to be cautious while deciding what he/she is selecting between the three solar panels. Battery capacity is a very vital aspect while considering to buy a solar generator. It is advisable to consider batteries with a high watt-hour (Wh) to achieve efficiency. If you go for batteries with low capacity regarding high watt-hours in means that you can only power very few devices and which do not require too much power to run. However, if you intend to achieve the best benefits of solar generators you need to purchase batteries which are capable of running devices with and appliances with a high wattage. Inverter rating is a key element to consider. An inverter rating is a figure highlighting the amount of watt you can discharge from a generator as you use it. It is important to note that to achieve the efficiency of the inverter; you need to use batteries with high capacities. The best ratio 1.5:1.0 of watt-hours to inverter rating are the most effective for the solar generator. In conclusion, it means that depending on your power desire you need to go for a large inverter rating if you need more power or small rating if you need less power. It is quite nice to have a solar generator which you can easily change its location from one place to another using minimum effort. It is good to consider the best portable generator with wheels, handles and has a weight you can bear in case you need it moved from place to another. However, the presence of wheels and handles is an added advantage since it makes even huge and heavy solar generators mobile. Finally, there are minor features you need to consider since they help you operate the solar generator effectively. Look for generators with High LCDs hence you are capable of monitoring the progress of the generator’s battery life. Also, consider generators which can help you expand your power through a connection of extra solar panels. Finally, wireless connectivity from a solar generator to an app on your phone is effective for monitoring. However, there are things you must avoid while purchasing a solar powered generator such as buying solar generators which have solar panels and battery installed in the same unit which could damage the life span of your battery. As stated earlier it calls for a potential buyer to do great research to understand what he/she exactly wants according to his/her needs. Setting up a solar system may is greatly influenced by several things which include the functions you want to accomplish and also the kind of a generator you prefer to use. An off-grid solar generator system is meant for mobile vehicles, and it calls for installation of solar panels, linking the panels to the generator, connecting your batteries, wiring the inverter and also setting up the regulator. An Off-grid system is an essential plan since it eliminates or reduces a public utility bill. Depending on the amount of power you need, it is advisable you have a nice budget to cater for four deep-cycle batteries and more than two solar panels. It is also vital you install a huge quality solar generator system which has an ability of power appliances which need too much power. With such a system you will meet most of the power needs efficiently. However, there are key elements that must be available for the setup of an off-grid system to kick off. Firstly, a high amp-hour deep-cycle battery is important for this kind of a solar system. This kind of battery will store a lot of power hence you need to worry about the regular and deeply discharge. You can choose the lead-acid batteries which are affordable and high quality or Lithium batteries which most expensive but efficient enough. Another thing to look into is the solar panels which you will use to charge your batteries. Mono-crystalline solar panels offer the best efficiency level despite being priciest. Poly-crystalline panels are a little less efficient but affordable and can do a good job. It is suggestive that you go for the Aluminum frame solar panels which are long lasting are a longer warranty. Also, you need to assess the warranty while installing the solar panels on an RV or another mobile vehicle since most of the time the warranty does not cover such solar panels. After acquiring your solar panel, it is important you pay attention to installation regarding the position. You need to obtain as much solar energy as possible hence install the solar panels facing the south at about a 30-degree angle. If it is not possible to install on the south side, you can have them on both the west and east part of the roofing. It makes them more effective and more reliable regarding obtaining solar energy. The third thing you need is an inverter since it meant to produce sine wave energy which is safe to use with most sensitive appliances and devices. You can opt to go for a 2000W inverter which can run anything except for appliances such as air conditioner. Finally, you need a nice charge controller to the voltage your batteries as they charge. It is important to ensure that the there is a maximum input of voltage that does not exceed the set capacity. However, a charger controller has a setback whereby it causes loss of power with about 40% of what the solar panel used is rated. It is advisable to use Ohms Law (watts = volts x amps) to calculate how many watts are fed to your battery. This set up is critical, and hence it requires experts to fix everything in place so that everything run as expected. However, it is an important and helpful kind of solar system you can depend on power most of your electric devices and appliances. Solar powered generators are a system which bears a lot of advantages to our current life from the environmental benefits to how they help in powering tools, devices, and appliances at low cost compared to paying off public utility bills. Despite the installation cost being expensive it a technology worth owning because it can act as your emergency backup anytime. Despite a few disadvantages the solar generator system face, it has a future of greater improvement and efficiency as technology is advancing on a daily basis and new ideas executed.